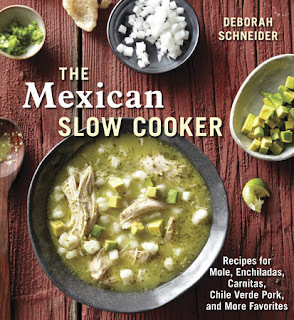 A while back, I received The Mexican Slow Cooker by Deborah Schneider. The idea sounded fantastic. We love Mexican food here, and I absolutely love slow cooker recipes. This seemed perfect. It is a wonderful cookbook, with some pretty amazing recipes in it. I'm far from an expert in authentic Mexican cuisine, but this does seem to be more Mexican, and less American-Mexican. For me, though, a lot of that is a downside. Almost all of the recipes take a lot of prep work, and involve more time than I generally have available to me. For instance, one amazing recipe is for Sopa de Elote y Calabaza. You are starting with fresh sweet corn, cutting the kernels off the cobs, which is fine. Then you get out a skillet and melt butter to cook the corn, onion and coriander. You add that to the slow cooker, and add a bunch of other ingredients, including the corn cobs. After it cooks for six hours, you remove the cobs, stir in epazote leaves, and serve. That is one of the easiest recipes in the book, that dirties the fewest pans. It is good stuff. The sophisticated meals part seems accurate, but "fix it and forget it" doesn't seem quite right. If you are looking for a cookbook where you can dump a bunch of ingredients into a slow cooker and more or less forget about it until dinner, this is not your book. If you have a bit more time and love real Mexican food, this could be a great fit.